Hope This Helps You: Soyami: Soya Chips that are So Yummy! Soyami: Soya Chips that are So Yummy! I was able to attend the Soyami Soya Chips mini launch at Active Fun (all the way to SM North Edsa) last October 22, 2010. Made from real Soya (that you can actually taste the tofu and burp it too! 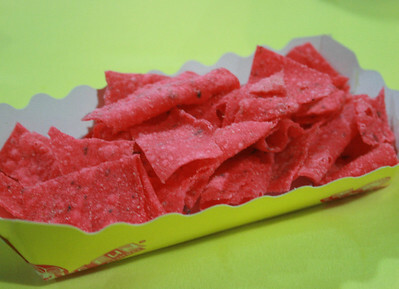 ), these chips are a healthier alternative to the usual chips we grab when we're having the munchies. Soyami comes in three flavors (original, white cheddar and pizza). Unfortunately, we've consumed the freebies we got before I remembered to take a picture. Born from a desire to provide healthier snack alternatives to their patrons at Active Fun, Soyami soya chips was conceptualized and became a hit, not just with the kids but with the adults as well. Now, Soyami is expanding and will be sold in groceries (and some schools too!) starting November. At P37 per 50 gram pack, it is a little steep compared to the usual potato chips we buy. For that price, however, you get none of the MSG and high sodium content of the usual chips as well. Since Soyami is made from real soya, it offers protein and fiber and calcium. Since FDA recommends 25 grams of soya protein per day as part of a diet low in saturated fat and cholesterol to help reduce heart disease risks, Soyami at least offers you 165 of that requirement and none of the saturated fat. Plus, Soyami chips are something you can send your friends and relatives in the Middle East as it's certified HALAL. Oh and they do taste great! Soyami won't satisfy any salty cravings, however, but it really does the job for when you need some crunch in your life. It's a perfect alternative for parents to offer their kids or for those who already have health issues but are craving for chips. As of this writing, their site is still undergoing construction but for further news, just check them out at www.amsoyami.com.